Advantech Wireless Technologies Inc. announced the release of the New 3.2kW Ku-Band Outdoor Modular/Summit Solid State Power Amplifier (SSPA) System. Advantech Wireless Technologies Inc, a global leader in satellite broadband communications solutions, has announced the release of the New 3.2kW Ku-Band Outdoor Modular/Summit Solid State Power Amplifier (SSPA) System. Designed to be used as direct replacement of older generation Klystrons or TWTs, these very high power, wide bandwidth, all outdoor ruggedized systems, allow operation over the entire Ku-band spectrum with multiple carriers, and outstanding linearity. 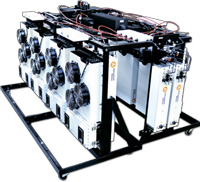 The new modular Summit systems have built-in redundancy with soft failure mode and are able to operate simultaneously on both polarizations or on a single polarization with double amount of power. “This new design concept is in response to the higher power and wider bandwidth demand of traditional large teleports, while at the same time reducing the OPEX. This powerful modular system, with built in redundancy, is an ideal choice for large DTH teleport uplinks. Without using expensive filter combiners, which make future frequency planning changes very complex and challenging the system is ready now, without extra investment, for new higher modulation and error correcting codes, as specified in DVB-S2X ,or higher data rates. Combined with a high gain antenna, this system can completely saturate all transponders on any satellite. It is a change that most teleports could benefit from, in order to stay competitive in an aggressive market,” stated Cristi Damian, VP Business Development at Advantech Wireless Technologies Inc. The design of the 3.2kW Ku-Band Outdoor SSPA is based on Advantech Wireless’ industry-proven reliable Solid State Power Amplifiers and over 25 years of experience with high-reliability systems. Advantech Wireless supports the critical need for High Throughput Satellite communications in a rapidly expanding digital environment. Our proven, low-cost, and highly reliable system solutions are meeting the ever-increasing need for high-bandwidth communications essential to military and government solutions, as well as cellular network providers, broadcasters, robust corporate networks, and security. We integrate award-winning research and development engineering into our designs. The result: custom solutions with lowest overall capital and operating costs, together with an unparalleled commitment to lead the industry in innovation, design and reliability. Find out more about us at advantechwireless.com.